It’s often stated by attendees at PCG Camps that the “brochure” can’t even come close to describing the value that is attained. But let’s try anyway! There’s WKO analysis and season preparation by the master himself. There’s daily rides where skills like sprinting, counter-steering, descending(!) and pacelining are taught and practiced. There’s on-the-road race scenarios where teams battle it out for all the glory. There’s stories from Hunter’s many, many years in the industry and as a professional cyclist. There’s SAG support, amazing A, B and C Road Groups for different levels, massages, yoga, stretching, on-staff bike mechanics, incredible food, bike fits, rider video analysis… There’s just so much! 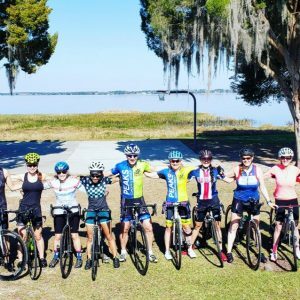 The goal of this amazing camp is to focus on improving your ride skills and techniques as well as race tactics and strategy–while accurately developing your power profile in WKO and setting up your 2019 season according to your goals! The beautiful Blue Ridge Mountains are the perfect place for a fall cycling camp with awesome climbing opportunities, quiet country roads for race scenarios, and it’s the hometown for the Peaks Coaching Group Headquarters! A $275 refundable deposit is due at time of registration. This deposit is refundable up to 60 days prior to the first day of camp. 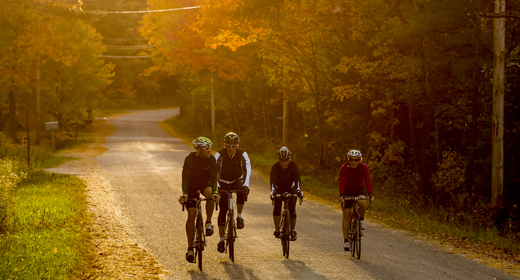 You will be issued a final invoice 28 days before the first day of camp, and final payment is due 21 days before the commencement of your cycling camp; all such payments are final, non-refundable, and non-applicable. 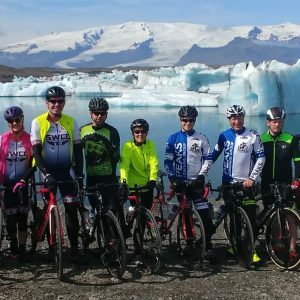 Peaks Coaching Group recommends travel insurance in case of emergency cancellation. Metrics are everywhere. What this camp does is equip you to read, interpret, and apply those metrics in more meaningful ways. 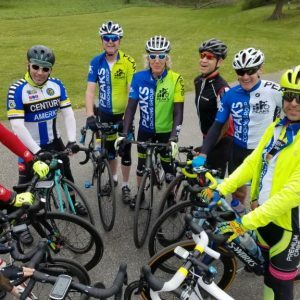 The riding is fabulous, but the insights gained in the classroom were even more exciting for me because I can integrate those into my training and general fitness pursuits moving forward. Highly recommended! Peaks Coaching Camp was the most fun, rewarding, and educational experience I’ve ever had on two wheels. I wish I had done this years ago. I was a little nervous about how my fitness level would fit in but there was no issue. I also initially thought the cost seemed high but discovered the value of the camp to well exceed the cost. The staff was exceptional, bending over backwards to make sure the camp was meeting our needs. I’m an experienced cyclist and user of WKO4. 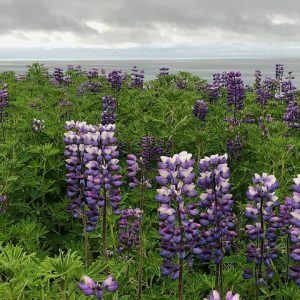 Hunter really exceeded my expectations in his teaching of power principles and how to put them to use to improve, no matter what level you are starting from. 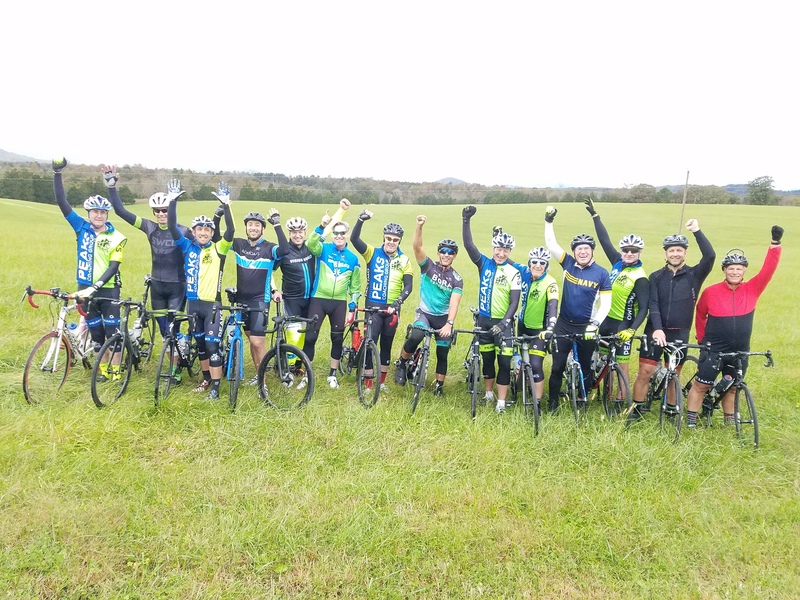 The Peaks Coaching Group Blue Ridge camp was an absolutely incredible experience! Bedford is beautiful. I learned so much from the coaches who are the best — extremely knowledgeable and accomplished; it was an honor to ride with them. From interesting power and nutrition presentations to sprinting practice, race tactics, climbing, descending, breathtaking mountain views, yoga, massages, recovery shakes, delicious meals and fun camp comrade, it was perfect. Everything was very professional and well organized. Definitely a must do! More kudos to you and your coaches. I did my first 20km TT yesterday at 20.83mph. I attribute my cycling growth to your camp. Remember I could barely average 15mph this April! A special thanks to Hunter and their excellent staff for a fantastic experience at this year’s Spring Training camp. They put on a first class event, totally exceeded my expectations. I have participated in many camps with other organizations in the past and I must say the PCG put on one of, if not the best, camp I have been to. The on bike and and class room instruction was highly educational as well as very fun. 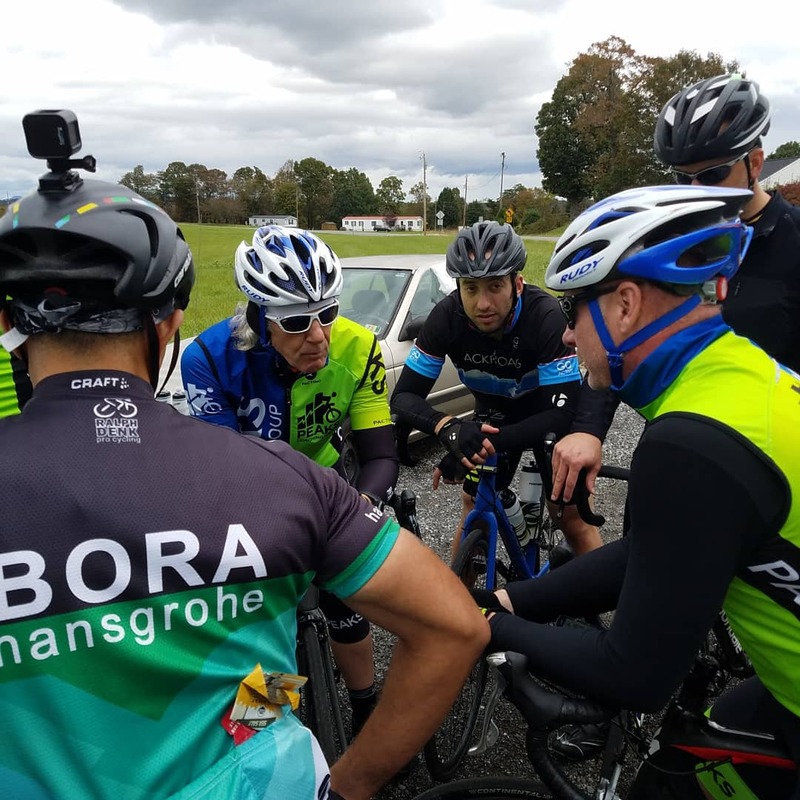 Riding with former pro Scott Moninger was very special. Even though I have been riding and racing for many years I learned a tremendous amount of new information. 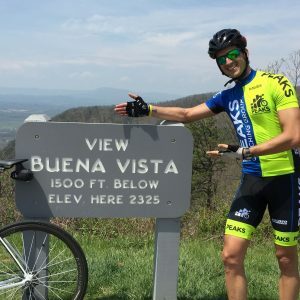 The riding in and around the Blue Ridge mountain is spectacular. I am very much looking forward to returning for another camp, hopefully next year. Thanks again Hunter! 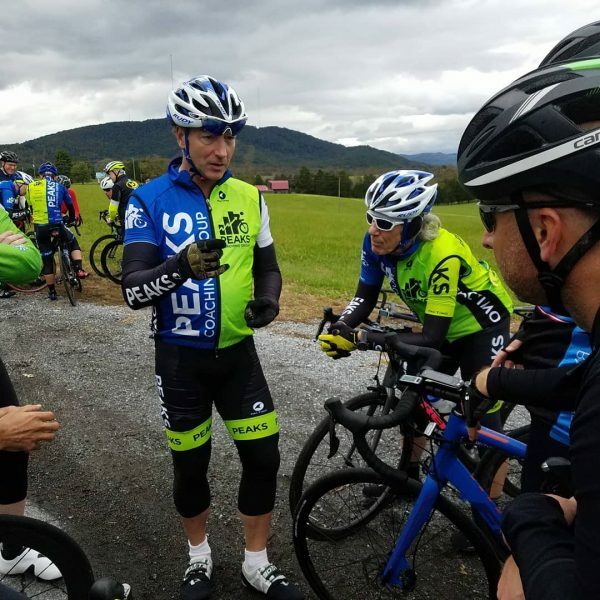 PCG camp is great opportunity to focus on bike handling skills and riding in a group. The on road testing to establish power profile is excellent. It truly was a fantastic week. Peaks staff – you were, to a one, knowledgeable, encouraging, friendly, supportive; everything you need to and should be. I can’t say enough. Keep up the awesome work. I’ll bust my arse this season and be back next year with more skills and better numbers, thanks to you! Marvelous experience! The camp was a marvelous experience for me. This was my first bike camp and also my first time negotiating anything with sustained climbing and speedy descending. I’m a lifelong flat-lander (Florida, Texas) and the coaches stuck with me and kept me rolling with confidence. A natural camaraderie developed amongst the campers, and amongst the coaches with the campers, providing a support that got me through some of the tougher days of climbing and mileage. Whether one consciously does so or not, we gauge the value of our experience against money spent. I’ve spent an all-expenses-paid, invitational week in an Olympic Training Camp and didn’t receive the personalized attention, positive encouragement, specific skills training and diversity of riding that I did with PCG. There is no substitute for training with those at the top of the sport, such as Hunter, and the Peaks Coaches. They don’t just ride with you, they make every ride you do better! Thanks so much for a fantastic week. I didn’t really have any expectations going in but came away learning a ton and having a really great time. You all took really great care of us and we got a lot of personal attention and advice on the road. I learned more in this one camp than in 18 months of riding with my team. Ride safe and see you all next year! Your camp made me much stronger!!!! Did a century last year that took me over 7 hours at 14.7mph. Today a century at 18.12mph. THANKS to Peaks coaching. The camp for me was, is, critical, to help energize and motivate me coming off my injury and for the coming season. It’s so great to attend the week long camp, with other cycling enthusiasts, who want to learn and improve their skills and conditioning. There is simply no substitute for camp with expert coaches with their skills, experience and immediate feedback. Thank you very much. The ride leadership and the on-the-road-coaching was excellent. Having the coaches out riding with the students is one of the best things about the camp. The student gets real time and hands-on feedback. The classroom, drills, and riding were well balanced. 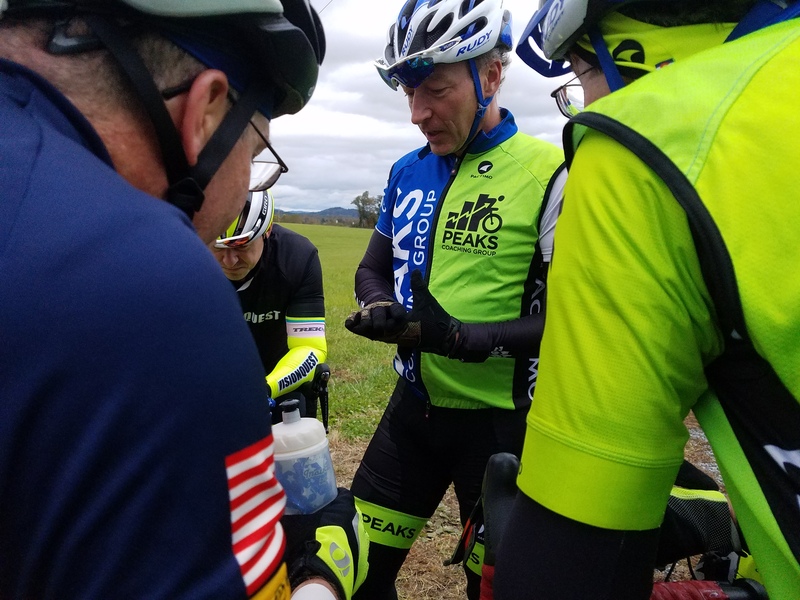 The SAG support was excellent and the Peaks Coaches out on the rode and in the classroom all demonstrated expertise and professionalism! Great overall experience and the riding was better than I expected. The roads and the climbs were all really fun. I wanted to thank everyone for their coaching, kindness, and thoughtfulness during the camp. I felt very comfortable around everyone. I also appreciate the organization. Everything was timed and coordinated well.